Check out this interesting event being thrown by OPB and the University of Oregon’s Agora Journalism Center. The State of Oregon is currently applying for HUD’s Natural Disaster Resilience Competition, and there is an opportunity for you to comment on the proposed projects. Check out the draft application, and send comments to hud@oem.state.or.us. Please include “HUD NDRC Application Phase 2 Public Comment” in the subject line of the email. The 2015 Annual Conference for the Oregon Chapter of the American Planning Association starts today, and I will be there to talk about the SRGP. Mostly, I’ll be talking about how the SRGP is currently accepting applications until the end of 2015. Check here for more updates on application procedures. The Oregon Coast Economic Summit was a huge success! Even Governor Kate Brown showed up! 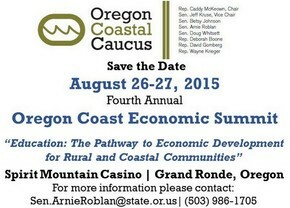 It is with great pleasure and much excitement that the Oregon Legislative Coastal Caucus invites you attend the 4th Annual Oregon Coast Economic Summit (OCES), which will take place on Wednesday, August 26th and Thursday, August 27th at Spirit Mountain Casino in Grande Ronde. This year’s theme will highlight the collaboration necessary to help young people prepare for our region’s and our state’s rapidly changing economy. The Summit will feature highly informative panel discussions on a wide range of topics with a focus on the Oregon coast’s unique economic diversity. 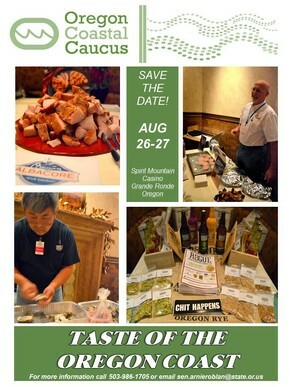 We are also pleased to announce the return of the very popular “Taste of Oregon,” a reception that allows attendees to sample locally made food and beverages from the Oregon coast, including products of the Dungeness Crab Commission, Pelican Brewery, Kruse Farms, 7 Devils Brewing Co., Tillamook Cheese, and many more. The attendance of more than 400 policy decision makers from federal, state, local and tribal governments, as well as the numerous educators and representatives from the private sector promise to make this Summit a vital think tank for the exploration of new ideas and new approaches to problems and challenges that face our communities. Please note that a block of rooms has been reserved for guests at Spirit Mountain Casino for Wednesday and Thursday nights at a special group rate. In order to secure a room at the discounted rate, please call the Lodge at Spirit Mountain Casino at 503-879-2350 for August Summit. Registration Code 603248. The SRGP Receives $205 Million for 2015-17! The Oregon Legislature recently approved $205 million to be used for the Seismic Rehabilitation Grant Program (SRGP). For 2015-16, $50 million will be spent on public schools. For 2015-2016, $125 million will be spent on public schools and another $30 million will be spent on emergency service buildings. The Legislature passed a separate bill to spend $125 million on a program to help build public schools in areas that are less seismically vulnerable. That means that Oregon will be spending at least $300 million in its effort to improve the seismic safety of public schools. Check out this web app I helped create that is meant to help Oregonians prepare for the impending Cascade Subduction Zone earthquake: http://www.opb.org/aftershock/. A few weeks ago, I had the opportunity to attend a build-a-thon at the Agora Journalism Center. During this 3-day event, I worked with web designers, map makers, journalists, and subject area experts to create a web app that will help Oregon residents prepare for the Cascadia Earthquake. The app allows the user to enter any address in Oregon in order to receive a personalized story about what you should expect to experience if the Cascadia Earthquake occurred while you at that specific location. Your personalized story tells you what you should expect when the earthquake occurs (shaking intensity, soil liquefaction, landslides, etc. ); how long your community will have to go without resources such as electricity, fuel, and running water; and how you should prepare yourself for the earthquake. In the end, our app produces over 300 individualized stories that help inform Oregon residents how to prepare for the Cascadia Earthquake based on location. Last week, I returned to the Agora Journalism Center to talk about this app as part of my presentation at the “What is Journalism?” Conference. Currently, OPB is working to finalize the app, and it should be available to the public very soon. Here is a promotional video about the app: https://vimeo.com/125524401. Please forward it to anyone who might be interested. Then, this past Monday, I got to head up to Seattle to present about the Seismic Rehabilitation Grant Program (SRGP) at the American Planning Association’s 2015 National Convention. Not only did I get to learn about community planning and emergency management efforts taking place around the country, I also got to promote the SRGP to a ton of APA attendees. So, stayed tuned for the new Cascadia Earthquake web app and more updates about the SRGP.